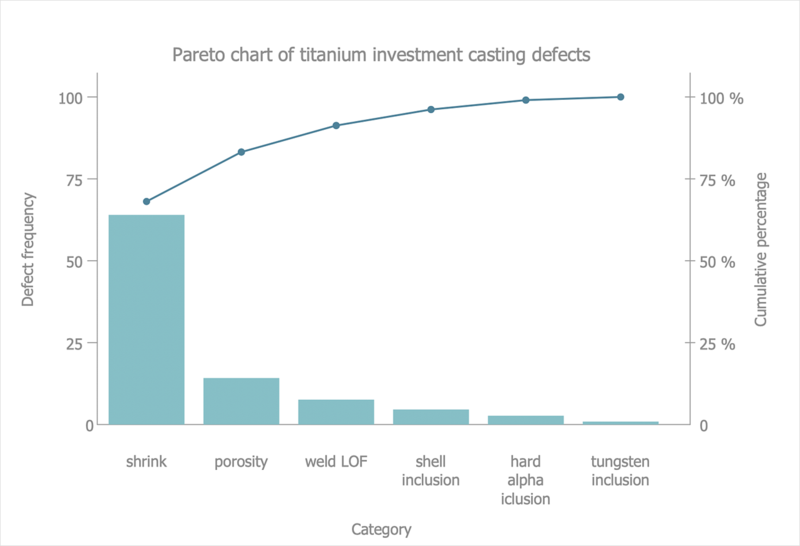 The Pareto chart is one of the seven basic tools of quality control. It combines both a bar chart and a line graph. You can create Pareto charts using the Seven Basic Tools of Quality solution. This solution is a paid add-on to ConceptDraw DIAGRAM. It provides individuals with extensive new libraries, templates and samples to assist in a quality control processes management. Select the Seven Basic Tools of Quality solution in the Solutions panel. Doubleclick the preview of the Pareto Diagram library to open it in ConceptDraw DIAGRAM Now you have a workspace and a corresponding library. Add a diagram object to the drawing by dragging it from the library panel to the document page. Select an object and use the Action button menu to add/remove points or change the axis appearance. To plot the data in the chart using the table click a table cell and enter the value of a point on the coordinate axes. To change the position of a point just change the value of the data in the table. Result: Now your Pareto chart is ready! A Pareto chart can be used to quickly identify the most common problems or issues within a business process.